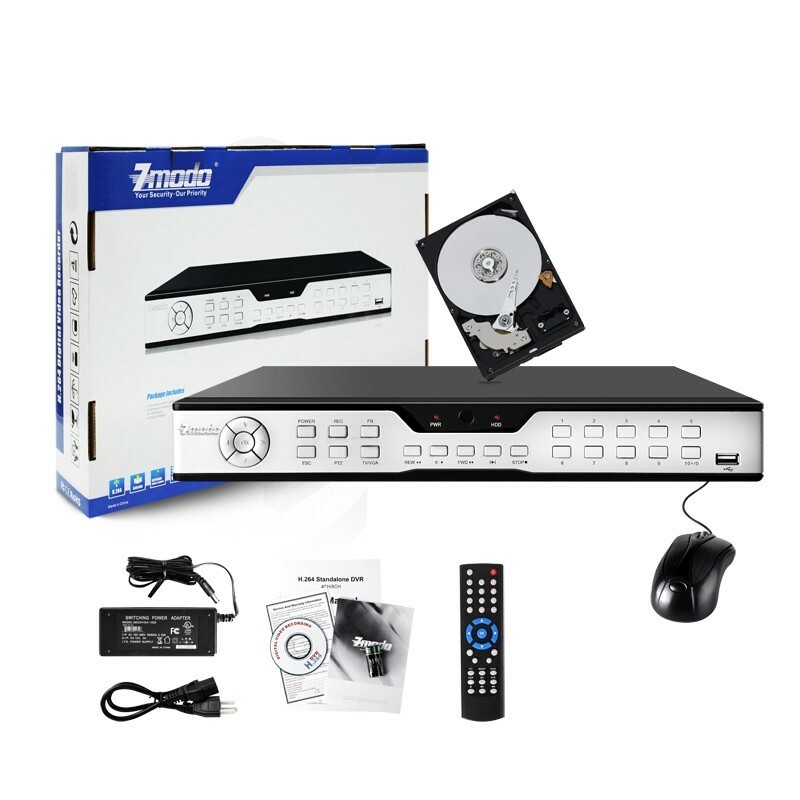 Click the button below to add the Zmodo 16 Channel Security DVR with 1TB Hard Drive 4G Viewing to your wish list. 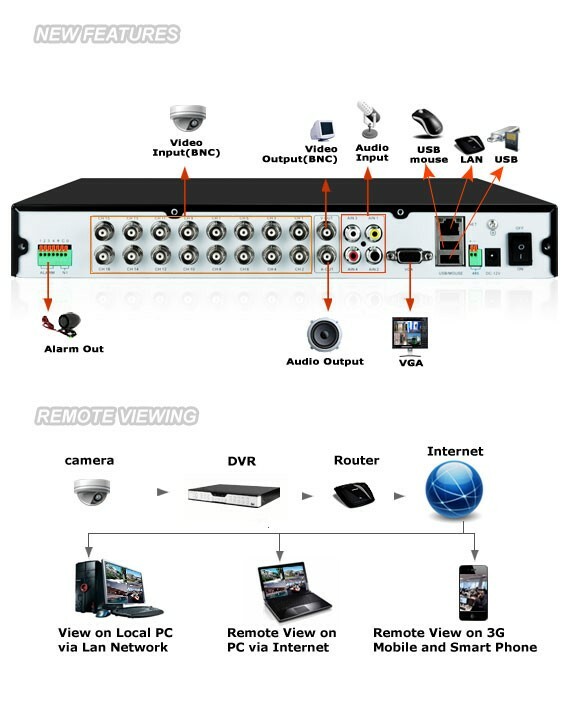 16CH H.264 Smart Security DVR with Internet & Smartphone Monitoring. The ZMD-DC-SBN6 is one of the best all around DVRs available. It is equipped with a 1TB Hard drive and has the capacity to record from 16 cameras. It is a great system at a great price. View Your Camera Footage from Anywhere in the World with ZMD-DC-SBN6, keep an eye on your business even when you are away. You have the power to access your DVR’s live video footage over the internet or directly from your supported smart phones, including Android™ 2.1 - 2.3, Symbian™ VM & V5, Windows Mobile® 5.5 & 6.1, iPad® IOS & iPhone® or BlackBerry® 7. This is the perfect DVR for any business. Application Support remote configuration, video browse, local recording, local and remote playback, and remote PTZ control. Multiple Recording ModesZMD-DC-SBN6 supports various kinds of recording modes, including manual recording, scheduled recording, motion detected recording, alarm triggered recording and alarm/motion detection triggered recording. Multiple Viewing Modes SwitchingSix viewing modes allow you to view 4, 6, 8, 9 or 16 cameras at once on a split screen, or view only 1 camera at a time. Advanced Motion Activated RecordingThe motion detection option allows you record only when motion is detected so that you save hard drive space without missing important events. You can even ensure that false alarms are not triggered as the easy motion detection “mask” allows you to block out areas with constant movement. Instant Email Alerts if Activity DetectedOnce the motion detection sensitivity meets alarm conditions, email will be sent immediately with the attachment of the caught snapshot. Once the FTP is set, FTP will upload the file after the alarm, and FTP server will receive the caught snapshot. Multi-Tasking FunctionalityThe multi-tasking feature allows up to five functions to occur on the system at one time: record video, watch live video, playback video while also monitoring and managing the system remotely, and also backing up files.Easy USB BackupA built-in USB port gives you the option of backing up and transferring your video footage with a USB flash drive or external USB hard drive.Search by Date, Time or EventSimply choose the desired date and time range, and the requested video clips will appear. Clips are also labeled by event, which makes it easy to find particular footage.Connect to a TV or PC MonitorVGA and BNC output allows you to connect to any PC monitor or TV monitor for viewing purposes. This gives you more options when viewing the activity captured by your cameras.1TB HDD Included1TB hard drive included in this DVR can record up to eight days continuously with full 30fps on all the 16 channels. Zmodo has been great to work with. This DVR was very easy to setup. I now have a full surveillance system setup. I never thought I'd be able to afford it! I'm so glad I found this site. Dvr was everything that they said would be. Easy setup , bought the port forwarding option when they called had me up and running in about 30 min. The only bad thing is the dvr cooling fans are a little loud .